Namak Pare are one of the most famous tea-time snack in India. 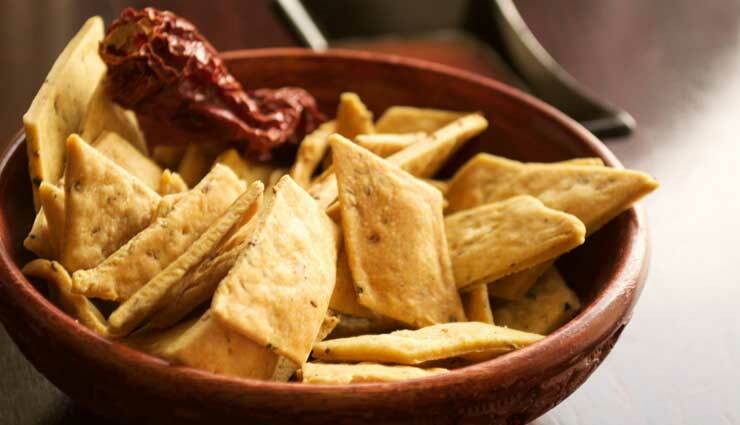 Every Indian home would have a jar full of these savoury strips to munch on. These are usually made of maida along with suji and deep fried till crisp, but here is a healthier namak para recipe that you'll love to indulge in and not regret later. Made with whole wheat flour and baked to perfection, you can enjoy this crunchy, crispy snack this festive season along with friends and family. * Mix the two flours and baking powder. Add ghee and rub in with fingertips to get crumby consistency. * Add salt and crushed carom seeds. Add sufficient cold water to make stiff dough. * Cover the dough and let it rest for some time. Preheat oven to 200°C. * Sprinkle some refined flour on a flat surface and roll out the dough into a half centimeter thick diskette (chapati). * Grease a baking tray with a little oil and sprinkle refined flour on it. Cut the rolled out dough into diamond shaped pieces. * Place them on the baking tray and bake in the preheated oven at 200°C for 15 to 20 minutes. * Serve hot or cool them down and store in an airtight container.